Hire the crackerjack WordPress developers who specialize in their fields. From creating the alluring themes to deployment on the server, our expert WordPress programmers maintain the working standards throughout the project. WordPress has a huge market and is one of the highly demanded technologies in the industry. Most of the websites have the WordPress technology implemented in it. Due to various themes availability and numerous features, it has gain popularity in the web world. We have outstanding programmers who made hundreds of websites and still continue to contribute. With our well-planned structure, it is easy for our developers to create result-oriented solutions. The solution is combined with coding standards and the latest technologies which makes a better combo for any business. These cost-effective solutions spread their magic within fewer days after launch and take the profits to peak. 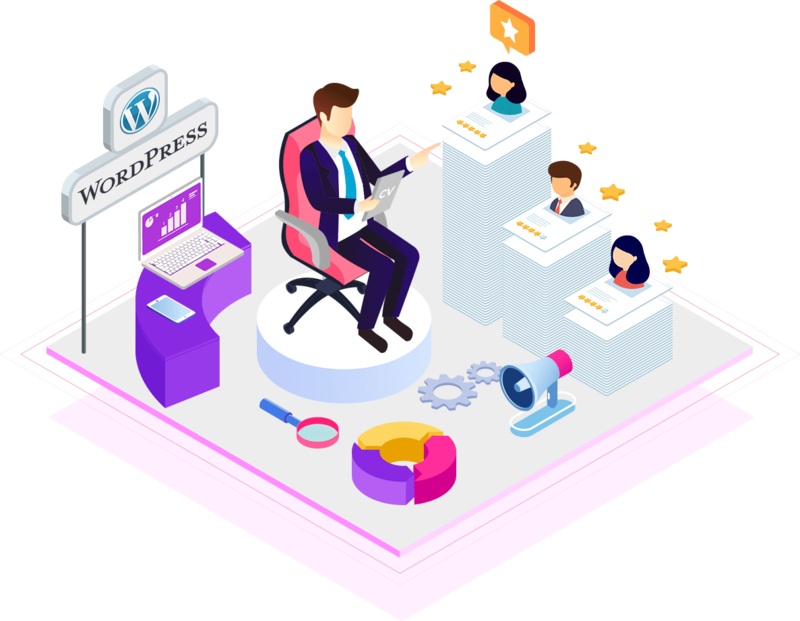 Hiring the best WordPress developers online is easy with NineHertz. Follow 5 easy steps and hire the best WordPress developers at an affordable cost. WordPress is considered among one of the best site building packages around the globe. It is the only site builders from which users can easily download and install for free. With the several add-ons for special functions and lots of plug-ins, it has covered the market in no time. Our developers have acquired every technique and tool for WordPress development. That is why we guarantee high-quality WordPress development services. We offer all kinds of versatile services related to WordPress with a user-friendly interface to our clients. It is easy to hire WordPress developers online. Simply share your requirements with us, we will analyze it and pick the suitable developer for you. Choose from the list of developers and hire according to the type. Hiring WordPress developers won’t take much time as we have an entire team working with us. Our WordPress programmers know multiple languages such as PHP, MySQL, HTML, etc. which improve the designing and overall activity of your website. For the applauding website, hire WordPress developers now! Take the benefit of the WordPress developer working at your development center. We are flexible enough to work at your work station. Hire WordPress Programmer in our workstation. We’ll keep the hired developers in the circuit of communication at the time of reporting. Mix and match of the onsite and offsite model, in order to achieve the desired goals. Hire WordPress programmer and a team of executives who are ready to work from both ends.